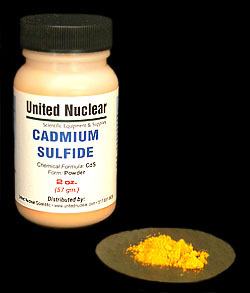 Cadmium Sulfide is a semiconductor (a direct bandgap semiconductor to be specific) with many applications in electronics and light detectors. It is used to produce photocells (photoresistors) as its conductivity increases when irradiated with light. When applied to thin films it can form transistors. It is also electroluminescent and pyroelectric, producing voltage when it is heated. Crystals grown from it can act as solid state lasers.